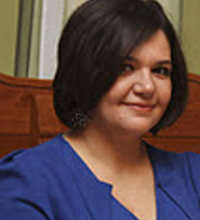 ELENI SOPHOCLEOUS is the Managing Coordinator of the Science and Technology in Archaeology Research Centre, at the Cyprus Institute. She holds an MA in International Political Economy from the University of Warwick, UK and a BA in Politics from the University of Leicester, UK. She had worked as a Project Manager for international and national projects relating to the development of educational and vocational training programmes for the past ten years. In the past Eleni was responsible for the management of several European projects, two of which received an award of excellence for the quality of their results by the Lifelong Learning Programme in Cyprus in 2010 and 2011.